We served these ribs on the 2017 Holiday Trail alongside a dollop of Rudy’s Cranberry Sauce and paired with Peach Creek Vineyards 2016 Regal Red Wine; the wine is dry and a little spicy, we think it’s a perfect compliment to the sweet/spicy rub and sauce on the ribs. 1 2 liter bottle Dr. Pepper Reserve 1/2 cup for the sauce. 1 - 2 Tblsp Misc Spices As desired such as Cumin, Fajita Seasoning, Cajun Seasoning, Garlic Powder, and Lemon Pepper. 1/2 Cup Bacon Jam We used "Better Than Good" Brand from HEB. 1 Tblsp Chili Seasoning Mix We use Wick Fowler's Texas Style False Alarm Mild Chili Kit. Remove the membrane from the ribs and place them in a large baking dish. 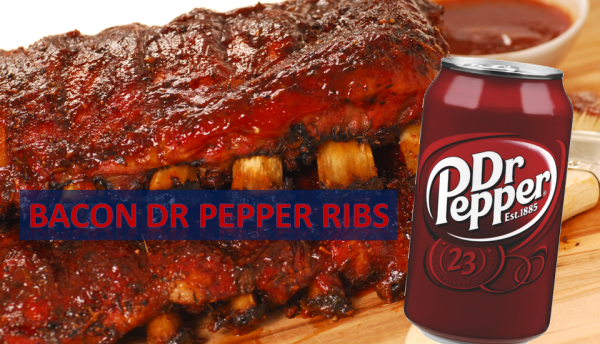 Cover them with Dr. Pepper (don't forget to reserve 1/2 cup for the sauce), salt, and 1/4 cup Worcestershire sauce. Cover and refrigerate them overnight, then remove the ribs and discard the juice. Mix brown sugar with spices of your choice; which ones we use, and how much of each, varies somewhat depending on who the ribs are being prepared for, but I doubt that the mixture is ever exactly the same. After removing the ribs from the marinade, coat them with the brown sugar mixture. Place the ribs back in the refrigerator for another night. Then grill over indirect heat until tender. Serve with sauce. To make BBQ Sauce: Saute' the onion and garlic in bacon grease until soft and fragrant; add bacon jam, Worcestershire sauce, chili seasoning mix, barbecue sauce, honey, and reserved 1/2 cup Dr. Pepper. Simmer for 15 to 20 mins, or until sauce thickens.